^ 1.0 1.1 1.2 1.3 1.4 Johannes Gerhardus Strijdom. Britannica Online Encyclopedia. [25 March 2010]. 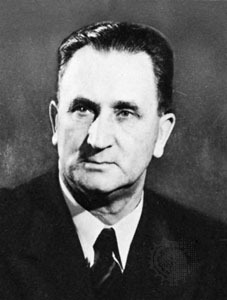 ^ Johannes G Strijdom. South African History Online. [25 March 2010]. ^ T. Kuperus. State, Civil Society and Apartheid in South Africa: An Examination of Dutch Reformed Church-State Relations. Palgrave Macmillan UK. 7 April 1999: 83–. ISBN 978-0-230-37373-0. ^ 4.0 4.1 Verwoerd should not be remembered fondly - DOCUMENTS | Politicsweb. www.politicsweb.co.za. [2018-10-19] （英语）. ^ Von Zeil, G. 'A South African Prime Minister's Medal' in Journal of the Military Medal Society of South Africa No 42 (August 2003). ^ 8.0 8.1 Denis Worral; Ben Roux; Marcus Arkin; Peter Harris; Gerrit Olivier; John Barratt. Denis Worral, 编. South Africa: Government and Politics Second revised (1975), second print (1977). J.L. van Schaik Ltd. 1977: 200 . ^ United Party (UP) (political party, South Africa). Britannica Online Encyclopedia. [25 March 2010]. ^ 10.0 10.1 Denis Worral; Ben Roux; Marcus Arkin; Peter Harris; Gerrit Olivier; John Barratt. Denis Worral, 编. South Africa: Government and Politics Second revised (1975), second print (1977). J.L. van Schaik Ltd. 1977: 202 . ^ Denis Worral; Ben Roux; Marcus Arkin; Peter Harris; Gerrit Olivier; John Barratt. Denis Worral, 编. South Africa: Government and Politics Second revised (1975), second print (1977). J.L. van Schaik Ltd. 1977: 201 . ^ 12.0 12.1 South Africa: Movement towards a Republic – JG Strijdom. South African History Online. [25 March 2010]. （原始内容存档于16 April 2010）. ^ The Development & Formation of the South African Republic. South African History Online. [25 March 2010]. ^ 15.0 15.1 Michael R. Marrus; Milton Shain; Christopher R. Browning. Holocaust Scholarship: Personal Trajectories and Professional Interpretations. Springer. 13 July 2015: 211–. ISBN 978-1-137-51419-6. ^ Ian Loveland. By Due Process of Law: Racial Discrimination and the Right to Vote in South Africa 1855-1960. Bloomsbury Publishing. 1 June 1999: 263–. ISBN 978-1-84731-083-5.